Discover Alaska by sea with a 7-night Glacier Discovery cruise. 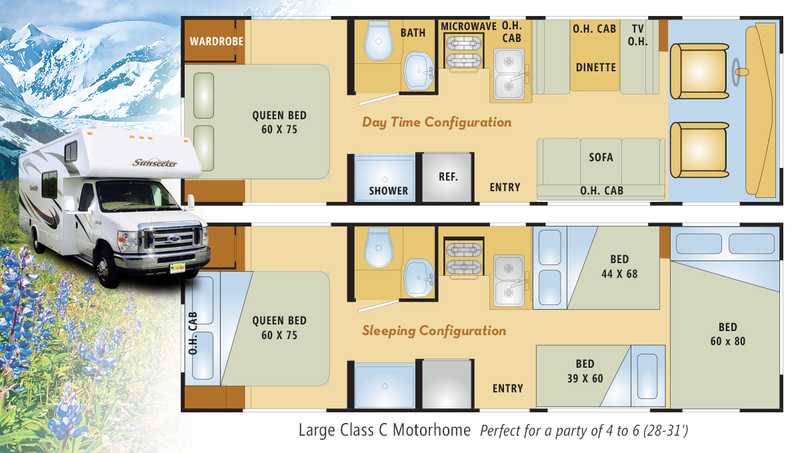 Then complete your adventure with a week-long motorhome tour of the Great Land. Reserved campgrounds every night, including 2 nights at Denali. *3-R calls on Haines in lieu of Skagway. WE=MS WESTERDAM; NO=MS NOORDAM; 3rd/4th Adult Share $929; 3rd/4th Child Share (up to age 18) $789; [3/3K] Gov’t Fees & Taxes: $313 ppdo; $244 3rd/4th. [3R/3KR] Gov’t Fees & Taxes: $313 ppdo; $207 3rd/4th. Drivers Insurance: $75 Per Driver; Cancellation Fees Protection: 5% of Total Price; Per Person, Double Occupancy (PPDO) prices are based on Interior Stateroom Category J. 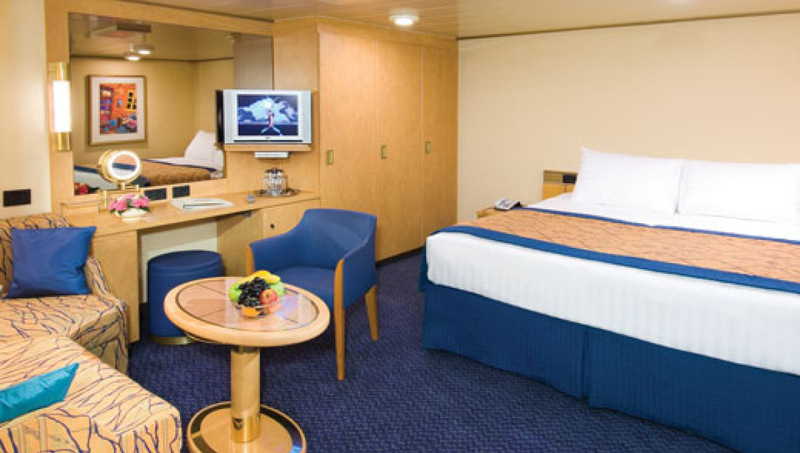 Call for Cabin Upgrade pricing. View Terms & Conditions. DAYS 1-7. GLACIER DISCOVERY CRUISE, CRUISE THE INSIDE PASSAGE. Board your ship in Vancouver, B.C. 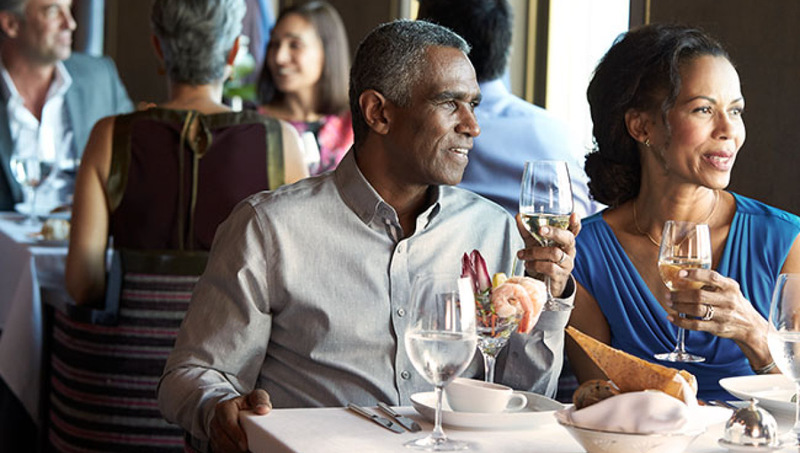 Your cruise includes ports of call at Ketchikan, Juneau, and Skagway, plus cruising Glacier Bay National Park and the Gulf of Alaska. Be sure and check out the variety of shore excursion options that are available to enhance your trip. DAY 8. SEWARD-ANCHORAGE. After you disembark in Seward, board your comfortable motorcoach or van for a scenic trip to Anchorage, where you pick up your RV. 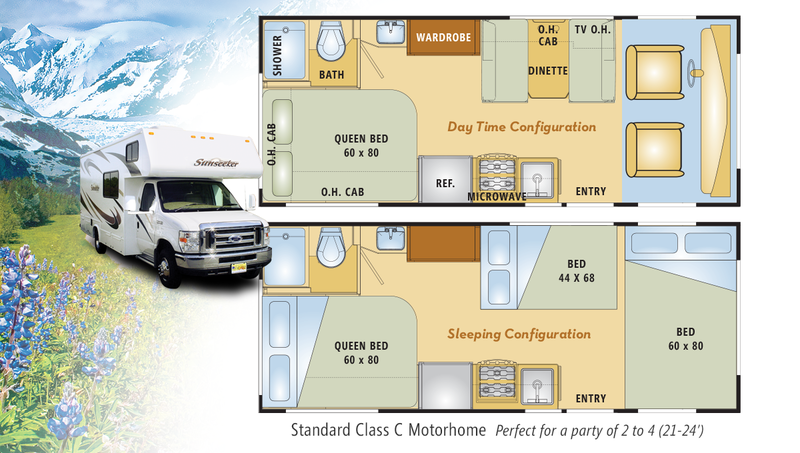 We give you a thorough orientation on your vehicle, then overnight at Anchorage Ship Creek RV Park. You’ll have time left to sightsee and stock up on groceries, or have dinner out. DAY 9. ANCHORAGE-DENALI. Drive the Glenn and Parks Highways to Denali, with mountain ranges to right and left. Watch for a glimpse of the Great One—Denali—if weather permits. Overnight near the entrance to Denali National Park. DAY 10. DENALI NATIONAL PARK. Your day to explore the Park. DAY 11. DENALI-FAIRBANKS. Rejoin the scenic Parks Highway, and drive north to Fairbanks, Alaska’s second-largest city. Keep your camera handy, as wildlife spottings are common along the road. Fairbanks is closer to the Land of the Midnight Sun, so you’ll have plenty of daylight after you arrive at your campsite. DAY 12. FAIRBANKS. There’s no lack of things to do here. Consider a visit to the University of Alaska-Fairbanks, with its excellent museum. Inspect a retired gold dredge, or view the TransAlaska Pipeline up close. DAY 13. FAIRBANKS-GLENNALLEN. You start your day driving on the famous Alaska Highway. At Delta Junction, branch off southward on the Richardson Highway. You’ll have many sightings of the TransAlaska Pipeline and gorgeous views of the Wrangell Mountains in Wrangell–St. Elias National Park. Overnight near Glennallen. DAY 14. GLENNALLEN-ANCHORAGE. Glennallen is the gateway to Alaska’s Copper River region, famous for its wild salmon runs. As you drive southwest on the Glenn Highway, you’ll enjoy more magnificent mountain views. Overnight at your reserved campsite at Anchorage Ship Creek RV Park. With long summer days, 120 miles of paved bicycle trails and breathtaking scenery, cycling is a wonderful way to explore Anchorage—check out our Bike and Bike & Carrier Rental Packages. DAY 15. ANCHORAGE, TOUR’S END. This morning bid your trusty vehicle au revoir, then we transfer you to the airport for your flight home. CUSTOM SELECTION 3R: RV Land Tour First, Followed by a Cruise. On day 1 pick up RV in Anchorage. Days 1 through 8 on land are same as 8 through 15 on Highway Cruise 3. On Day 8 drop off RV in Anchorage, transfer to Seward and sail to Vancouver, B. C. NOTE: The southbound cruise itinerary features a Haines port call in lieu of Skagway. CUSTOM SELECTION 3K: Deletes Fairbanks. Adds the Denali Highway and Kenai Peninsula. On day 11 drive from Denali to Glennallen. Travel from Glennallen to Cooper Landing on day 12 and Cooper Landing to Homer on day 13. Return to Anchorage on day 14 and overnight. Day 15 remains unchanged. Add $100 per party for this Custom Selection. CUSTOM SELECTION 3KR: RV Land Tour First, Followed by a Cruise. Tour begins in Anchorage. Drive to Cooper Landing on day 1 and Homer on day 2. Overnight on day 3 in Anchorage and drive to Denali on day 4 for two nights. Drive the Denali Highway on day 6, overnighting near Glennallen. Day 7 return to Anchorage for final overnight on land. Turn in the RV the morning of day 8 and transfer to Seward to set sail for Vancouver. See note on southbound cruise itinerary under Custom Selection 3R above. Add $100 per party for this Custom Selection.